I’m sitting in the Hostal Gardner here in Puerto Ayora, Galapagos waiting for the Steelers-Pats game. It’s already over (it happened last night) and either Rothlisberger has prevailed or Brady has yet again displayed super-human abilities. Or maybe both. But I don’t know who came out on top and ESPN3/Español will, through pre-recorded programming, lead me to NFL nirvana. It’s still 8 hours until the broadcast, so what to do? It’s surprisingly cool today, 10 feet above sea level and a few miles south of the Equator. The proprietress of the hostal, Janina, has invited me to take a trip to the highlands of this island to view giant land tortoises, see 2 collapsed craters, and walk through some lava tubes. Her recently married cousin, the cousin’s husband, and Janina’s boyfriend will be going with us too. This should eat up some time before kickoff. I’d also like to review the jungle trip that I took last month. But I saw so much and La Amazonia is such a critically important region of the world that I’m going to split my account into 2 postings. I’m also going to post more images to go along with the postings, since this was a visual journey. WordPress, the group that hosts my blog, has a feature called a photo-carrousel, so I’m going to try that out too. Let’s see how this works; in Spanish: ¡Vamos a Ver, Compañeros! I had decided to follow my nose and hook up with a place called Jamu Lodge. It’s located on the right bank of the Rio Cuyabeno, one of the major tributaries in Ecuador leading down to the Amazon River. Though I didn’t know it when I signed up, I later learned that the Cuyabeno is a “black-water” river, fully saturated with tannins from trees growing in the surrounding forests. These tannins not only stain stain the water dark but they also lower the pH to around 5.4, which makes for an acidic environment. It also means NO MOSQUITOS! It’s hard to believe that one can visit the Amazon basin and not be eaten alive by these parasites, but sadly (not!) this was the case. After a 7hr overnight bus ride from La Mariscal in Quito I found myself at dawn in Lago Agrio. This is an oil-drillers town hard up against the Colombian border (across the Rio Putumayo) and reputed to frequently host visiting FARC guerrillas on their best behavior. Well, I didn’t see any. But I did have breakfast at Hostal D’Mario while waiting for another bus which would take us to the end of the road. In the meantime I was entertained by a vendor selling medicinal tonics. These folks with their pushcarts are fairly common in cities and towns throughout Ecuador. Here in Lago Agrio this young lady was pouring liquified herbs from jug to jar to jug to jar with a brilliantly choreographed style. And her bluejeans were one-of-a-kind. Finally by mid-morning this other, much smaller van showed up. The driver stuffed me and nearly a dozen fellow trippers inside and we took off. I was surrounded by Germans, Dutch, Belgians, a Scotsman and his French wife. Except for the Scotsman they all spoke passable English. We had 2 more hours of sitting in the van until we ran out of pavement and boarded a long canoa for yet another pair of hours motoring down the Cuyabeno to the lodge. By this time I was done with sitting for the day. Or so I thought. After an hour or so of unpacking, introducing ourselves and settling in, we gathered back at the dock to go up the river for a sunset swim in huge lake formed by the Cuyabeno. Since by then I’d already been back in Quito for a month, wearing layers of fleece for the ever changing high-elevation climate of the capital, it was downright paradisiacal to be clad only in a bathing suit floating, splashing, blowing bubbles and stroking around the boat while watching a beautiful sunset in one direction and a moonrise in the other. I haven’t been to heaven yet but if it’s anything like swimming in that lake at sunset, I’ll be knocking on its door. The real wonder though, was that this was the first of successive evenings that we spent swimming at sunset. And as the moon was on the wax, each night was more stunning than the night before. After several of these swims we stayed out late for either a nighttime walk through the forest or we floated down the river spotting caimans or a tree boa or we were enchanted by the hundreds of fisher bats, the largest of the bats in Cuyabeno Reserve, swooping down to the water for a night’s feast of small fish. By day we also traveled either up the river or down it or on one of the feeder streams with our guide Sulema. She was a fantastic set of eyes for us, motioning the motorman to halt the canoe countless numbers of times as she spotted monkeys or birds or sleeping bats, plus 1/2 dozen anacondas throughout the week. I knew through readings that this part of Ecuador has some of the highest concentrations of wildlife in the world. But to be there, on the water, and witness this abundance is a spellbinding experience. A day-walk through the forest is a great example of our time there. We were sloshing (knee-high Wellington boots are the only way to do this) up a trail when Sulema stopped at one of the trees. It could have been any tree as far as I could tell, there were so many of them. Some scientists argue that this portion of the rainforest contains more vegetation per square foot than any other spot on earth. I surely won’t contest that point of view. As it happens she stood in front of a cinchona tree, where quinine comes from. She explained how the bark is stripped, then dried to a powder and used as an anti-malarial medicine. This bark, in powdered form, was the basis for Samuel Hahnemann’s development of homeopathy for treating diseases. Here, growing wild in the rainforest, it seemed to me like just another tree. Who knew? It turns out many, and for thousands of years in the Quechua culture. After much oohing and aahing from her charges Sulema then proceeded to blow our minds. In a fold in the bark of the cinchona, known as quina locally, she pointed out what appeared to be a sleeping beetle about 2 inches long. She ordered each of us to get close enough to see a tiny thread with a white dot protruding from the head of the bug. This insect wasn’t sleeping, it was dead. And the dot on the filament were spores of a microscopic fungus the beetle had ingested. The fungus feeds on the brains of this and other insects. She explained that eventually the fungus causes the insects to act like zombies and find protected locales for their final resting places. To complete its cycle the fungus bores through the head of the bug and the spores on the end of the stalk are released into the atmosphere to find new hosts. How’s that for nightmares? I noticed that several of the group seemed to be trying to hold their breaths until she said that this fungus was very specific to insects. The collective sigh was short-lived though when she continued by saying that there were literally thousands of different kinds of air borne fungi like that and we were breathing them in all the time. Sleep well tonight will you? Actually, I did. After finally identifying this bird I came to realize that it was impossible for an outsider to “know” the Amazon even in several lifetimes. Sulema was showing us the easy stuff, animals large enough or common enough for even us lumbering, loud, and camera-flashing tourists to see. And to know that we were only scratching the surface of the abundance of life here is a very humbling realization. But you take what you can get and what we got was a lot, so we continued on. One of my hopes while in the reserve was to finally see monkeys in the wild. When I was in Guayaquil I took a guided day-trip to Manglares Churute, a vast mangrove reserve and we hoped to catch a glimpse of howler monkeys, the largest in this part of the world. But a rambunctious group of teens had proceeded us on the path half an hour before, both laughing and chasing the monkeys deeper into the forest with their noise. Though I fully enjoyed myself (except for the snake encounter), I really was disappointed that we could only hear them and occasionally see a shadow or two. Fortunately the Cuyabeno, and more specifically Sulema, didn’t let us down in this respect either. Of the 9 or so species of monkey in the reserve, we were able to spot 6, including the tiniest, the Pocket Marmoset, smaller than my hand. We saw the Wooly Monkey, with a tail as bushy as a raccoon’s but twice as long as the entire raccoon. We saw White-faced Marmosets and a few others of the marmoset family but I’ve forgotten their names. Yet the real stars in the region are the Spider Monkeys, flitting through the trees in tribes of many dozens of animals at a time and not too worried about human trespassers. While we didn’t have the good fortune of 2 other groups at the lodge, where the monkeys actually came down to just a few feet from their canoes, I had my needs met to be sure. Tarantulas, and scads of other spiders as well, were pretty common near the lodge. 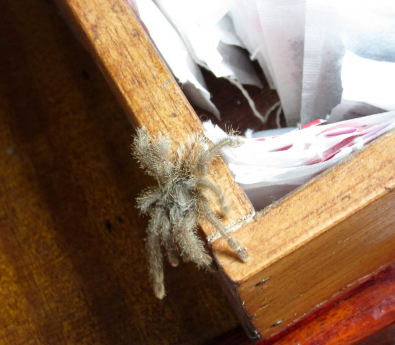 And we even had a juvenile who made itself at home in the tea caddy. Each night and on the same tree there were 2 trophy specimens that lumbered slowly on, in search of smaller prey. The lodge also hosted a mild tempered parrot (loro, in Spanish) who often decided to perch on a guest and tour the facilities. Of the lodge itself, nothing could be found amiss. From the mosquito netting covering each bed that prevented intruders from disturbing our sleep, to the inexhaustible and delicious food for each meal, to the friendly and attentive staff, this was the way to see the Amazon Basin. Elías, the head waiter, could give the best of English butlers a run for their money in his unobtrusive yet excellent and cordial way of anticipating every need. We were living the life. So with that, I’m going to end part one here. This entry was posted in Amazonia, Indigenous and tagged Amazonia, Cuyabeno, Galapagos on 2015-09-11 by kmalivuk. Great post, wonderfully enhanced by your captioned photos. As usual I’ll have to read it at least 2 or three times. Thanks for putting this together for us. Extraordinary piece of work. The Potoo reminds me of our night heron that hides similarly in the daylight and goes fishing and frogging at night.